The maps open in another window (tab). Background: wind maps and logbook. Mouse Over buttons show pictures of sailing and weather conditions. Mouse clicks open videos and other media elements. The pictures of sailing conditions correspondent with the wind maps, thus allowing to to compare expected (wind maps) and observed (pictures, logbook) sailing conditions. 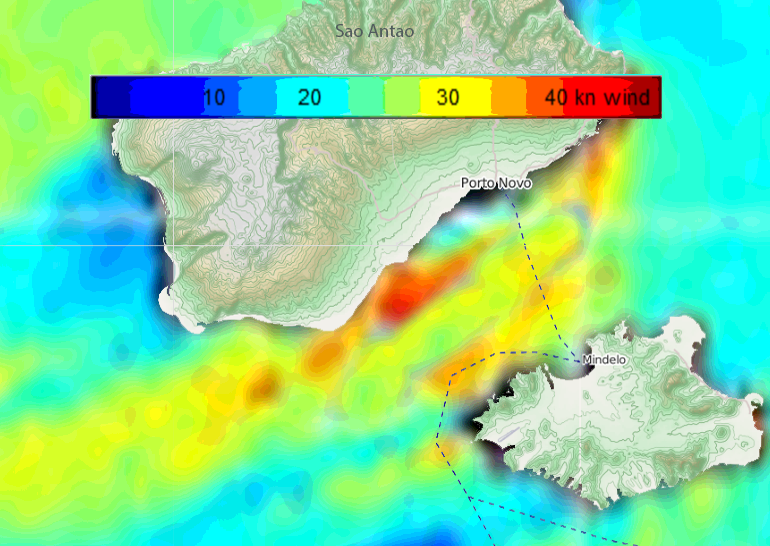 A detailed wind map for a typical day in Cape Verde is shown in several interactive maps. They show the typical wind climate in Cape Verde. The wind map is based on a satellite SAR image from Envisat (6 June 2006). The wind direction is from the northeast. From the SAR wind map it is clear that wind speed variations occur. There are lee-effects of the islands (dark blue areas). The lee-effect is due to the mountains of the islands. The larger and higher the island, the more pronounced is the lee-effect. There are also examples of gap-flow, i.e. accelerated wind flow (seen as yellow and red area), between the two islands Santa Antao and Sao Vicente (see picture below) and other islands. Courtesy of DTU Wind Energy, Denmark. Pictures from the Islands, photographers see “About”. This entry was posted in Info, Interactive Maps and tagged cape verde, wind. Bookmark the permalink.